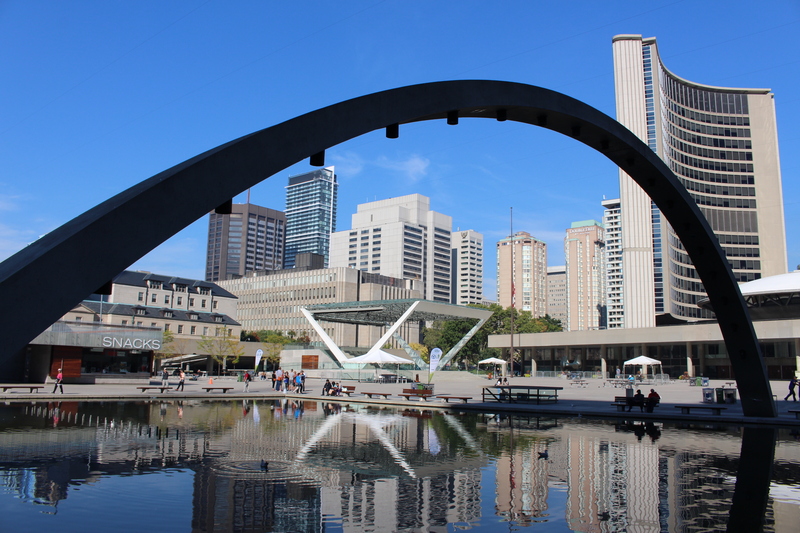 It is ALWAYS easy to find seats at the Nathan Phillips Square (Toronto City Hall outdoor area). Perhaps it has been that there were no events planned on the day I visited, or I happened to pass through at an early hour(11:00 am? ), or I am incredibly just lucky at finding empty seats. 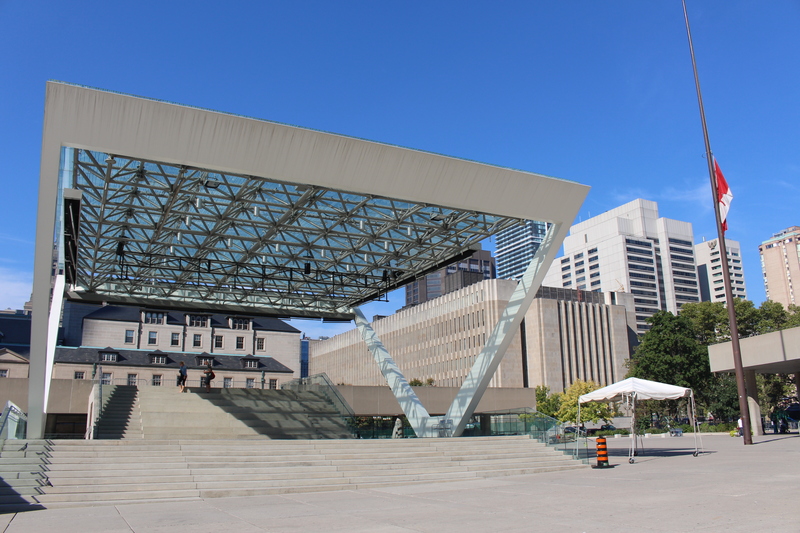 OR, could it be that the Square is an “uninspiring” place for Torontonians / tourists who are not interested in visiting? I cannot remember the last time I was passing through the Square to just hang out and enjoy the day….rather, it has been always with some reasons such as “need to submit the project drawings at the building department by 4:00pm”. Of course, the obligation of getting building permits forced me to walk fast through the Square without giving much of notice of the surrounding. 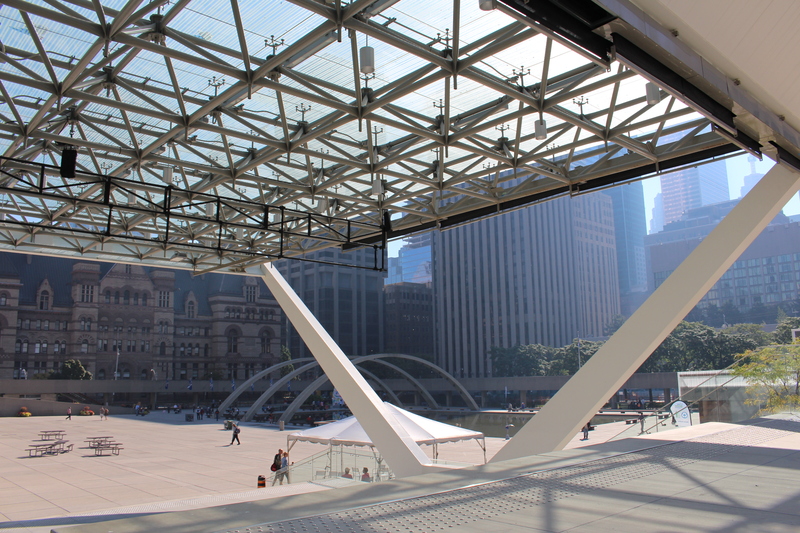 The outdoor Square seems to include interesting built elements (roof top garden, big skating rink, half circle shaped City Hall buildings)…..however it still lacks the interest that brings people together at one of the well known spacious outdoor space in Toronto. The moment sitting at that exact spot felt completely different from when I first walked into the Square looking for a place to sit: feeling of tiredness somehow disappeared and replaced it with energy I did not have before. My guess is that the couple who was sitting down next to me were feeling the same; after sitting down for some time, they started running around the rows of stepped seats, and took the pictures of the structure, as well as themselves with it. The experience of sitting on the steps of the Stage took me back to my graduate school years in NYC. One of the professors had asked us what we thought as the best urban designed areas in the NYC. While each of us trying to outdo each others with the best answers such as Central Park, Lincoln Center, Columbus Circle, etc, the professor commented “how about the stairs (Grand Stairs at the Columbia University) you guys are sitting down right now? He was absolutely right! We all had to admit that we were pretty lucky to experience the amazing moment together.